Stacey Gomez, action coordinator of the Centre for Gender Advocacy reported a success for the annual March for Missing and Murdered Indigenous Women held on Feb. 14. For the first time, the event was held indoors, at Complexe Desjardins starting at 5 p.m. This is the tenth year community members in Montreal have gathered to demand justice for missing and murdered indigenous women. “This year we decided to do something different, but with the same vision of the march,” said Gomez. In past years, there have been bad weather conditions leading to inaccessibility and harm to participants due to the severe cold. As a result of the mobilization being held indoors, it was easier for participants to be more present and listen to performers at the event, said Gomez. “We had a flash mob that was Valentine’s-themed,” said Gomez. 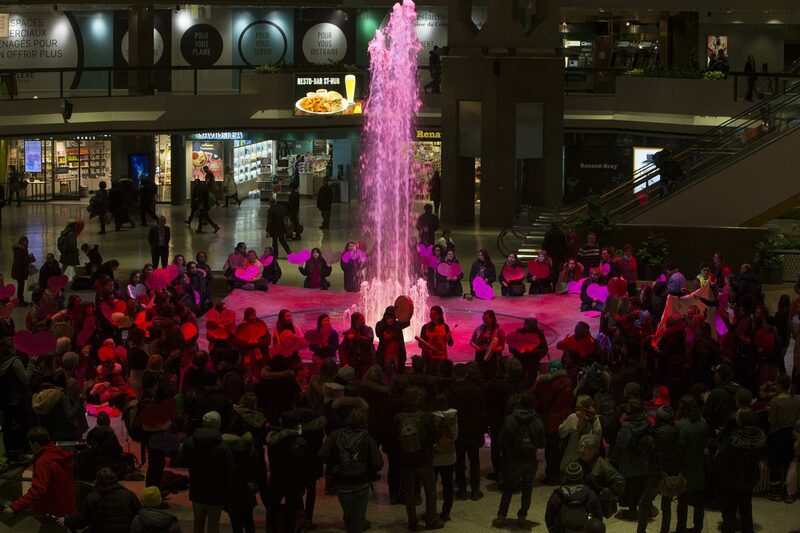 “We walked through Complexe Desjardins with hearts that had the names of women missing from different indigenous communities [written on them],” said Gomez. Participants held a banner calling for justice of indigenous women, muslim women and women of colour, added Gomez. “The aim of the event is to honour folks who have been victims of racialized and gendered violence,” said Gomez. However, she said the event is focused on the pursuit of justice for indigenous women. “There’s now a national inquiry around missing and murdered indigenous women,” said Gomez. She said, however, within the current inquiry there are issues that need to be resolved. Gomez said there has been a lack of communication until now with a lot of family members in relation to these cases, that there have been concerns this inquiry has not received enough funding and that there is not enough justice, considering the fact cold cases are not being re-opened for investigation. Indigenous women make up three per cent of the population in Canada, according to the Native Women’s Association of Canada. However, according to the same source, 10 per cent of all homicide victims in Canada are indigenous girls and women. Following the mobilization at Complexe Desjardins, participants marched towards the Native Friendship Centre located at 2001 Boul St-Laurent. At the centre, participants were welcomed to attend a community dinner with guest speakers invited to discuss the issue of missing and murdered indigenous women, as well as racial and gendered violence, said Gomez. For those who are interested in joining future mobilizations for missing and murdered indigenous women and for more information on the issue, Gomez recommends visiting faq-qnw.org.com, nwsm.info and MissingJustice.ca.